Denise Gough as Emma, an actress who goes into rehab after coming unhinged onstage, in People, Places & Things. Gough won an Olivier award for the role during the play's London run. Over the years, many authors have dealt with alcoholism, addiction and recovery — think of plays like Long Day's Journey into Night, or films like Days of Wine and Roses. Now a new play from England joins them: People, Places & Things takes an unsentimental and, at times, harrowing look at addiction and recovery. As it begins, the lights come up in the middle of a scene from Chekhov's The Seagull. The actress playing Nina is woozy and disoriented — clearly high or drunk. Or both. She collapses, and all hell breaks loose onstage — lights flash, loud music plays, actors dressed as EMS workers strip her of her Victorian costume, gurneys whiz by. It's the start of a journey which takes Emma, the actress, on the painful and difficult road towards recovery. "On paper it sounds like a nightmare at the theater, right? You know, watching an actress who's addicted to drugs trying to get clean and sober," says Denise Gough, who plays Emma. "But actually, it's just a metaphor for a person who wears masks in all her areas and then trying to keep all the masks going." "I know people in recovery. I know people with addiction issues," says playwright Duncan Macmillan. "I know people, even in the course of researching and working on this play, several of the people who I was thinking of and talking to about it died." So, Macmillan says, he didn't want to resort to tired old stereotypes about addicts: "That they're these tragic people who can only die to serve the narrative. And I was interested in sort of redressing that and trying to find a way to accurately represent and respectfully represent the daily struggle and the daily work of living in recovery." After her breakdown onstage, Emma checks into a treatment facility — she tells another character she chose it because of its ugliness, to remind her that the world is "all just purposeless chaos." The creators of People, Places & Things visited such a place, while doing their research, says director Jeremy Herrin. "We went down to a place in Catford, in southeast London; a very low-rent recovery center called Freedom, which was completely inspiring. And the stories that we heard and the people that we encountered there were — right, it was absolutely amazing, it was a real privilege." That's not to say that the characters in People, Places & Things are presented as heroes. Playwright Macmillan shows the ugly side of addiction and recovery, and he wants the audience to constantly be asking questions. "Who are you? What are we watching? What's true and what's not? Addicts lie, they have to lie. They get really good at it. And actors lie because that's what they're paid to do," he says. At the center of the play is the 12-step process. Steps two and three acknowledge the existence of a God who will save you. That's hard for Emma, and it was for Macmillan, too. "I just thought well, 'God, if I had to do this, I would not be able to surrender my critical faculties so easily. And if that's what's required to save my life, I think I'm not going to make this.' And the journey I've gone on in writing this play, I've softened a lot about all of that stuff, because essentially it's just about realizing that there are things that are beyond your control; that you can't control." Part of the process the addicts go through at the recovery center — where most of the play takes place — is rehearsing what they'll say to people, out in the quote-unquote real world. It's something that Emma, who's an actress, is well-versed at. 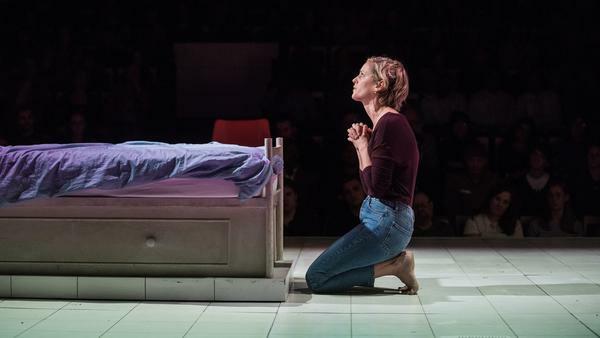 But Denise Gough says once Emma ventures outside and confronts the world's people, places and things, she gets knocked for a loop all over again. "You don't know at the end of the play if she's going to be all right," Gough says. "And that's really important, because we can't know. I didn't want to be in a play that sugarcoated any of this. There's no point. I've met and know and I've been around too many people who have suffered this disease to go on stage and say there's a happy ending. We don't know that. It's one day at a time." That's a life-and-death point Macmillan says he wanted to make. "One day at a time," he says. "And life has to win every single day. And death only has to win once." In New York, a play about addiction and recovery has just opened to rave reviews. It's, of course, an issue very much in the news. In fact, the day after the play opened, President Trump declared the opioid crisis in the United States a public health emergency. Jeff Lunden reports now on "People, Places And Things." JEFF LUNDEN, BYLINE: The lights come up in the middle of a scene from Chekhov's "The Seagull." LUNDEN: The actress playing Nina is woozy and disoriented - clearly high or drunk or both. UNIDENTIFIED ACTOR: (As character) Nina. Nina. Emma? Emma. LUNDEN: She collapses, and all hell breaks loose on stage. Lights flash. Loud music plays. Actors dressed as EMS workers strip her of her Victorian costume. Gurneys whizz by. It's the start of a journey which takes Emma, the actress, on the painful and difficult road towards recovery. GOUGH: On paper it sounds like a nightmare at the theater - right? - you know, watching an actress who's addicted to drugs trying to get clean and sober. I mean, oh, my God. But actually, it's just a metaphor for a person who wears masks in all her areas and then trying to keep all the masks going. DUNCAN MACMILLAN: I know people in recovery. I know people with addiction issues. MACMILLAN: I know people - even in the course of researching and working on this play, several of the people who I was thinking of and talking to about it died. LUNDEN: So Macmillan says he didn't want to resort to tired, old stereotypes about addicts. MACMILLAN: That they're these tragic people who can only die to serve the narrative. And I was interested in sort of redressing that and trying to find a way to accurately represent and respectfully represent the daily struggle and the daily work of living in recovery. LUNDEN: After her breakdown on stage, Emma checks into a treatment facility. GOUGH: (As Emma) I chose this place because it's ugly and gray and in the middle of a car park. And I can look out on traffic and homeless people and remind myself that the world is all just purposeless chaos. I need something definitive. I need to be fixed. BARBARA MARTEN: (As Doctor) It doesn't work like that. LUNDEN: The creators of "People, Places And Things" visited such a place when doing their research, says director Jeremy Herrin. JEREMY HERRIN: We went down to a place in Catford in southeast London - a very low-rent recovery center called Freedom - which was completely inspiring. And the stories that we heard and the people that were encountered there - it was absolutely amazing. It was a real privilege. LUNDEN: That's not to say that the characters in "People, Places And Things" are presented as heroes. Playwright Duncan Macmillan shows the ugly side of addiction and recovery, and he wants the audience to constantly be asking questions. MARTEN: (As Doctor) Do you lie to protect yourself or your addiction? GOUGH: (As Emma) It's not lying. It's admitting there's no truth to begin with. MACMILLAN: Addicts lie. They have to lie. They got really good at it. And actors lie because that's what they're paid to do (laughter). LUNDEN: At the center of the play is the 12-step process. Steps two and three acknowledge the existence of a God who will save you. That's hard for Emma, and it was for Duncan McMillan, too. MACMILLAN: I just thought well, God, if I have to do this, I would not be able to surrender my critical faculties so easily. And if that's what's required to save my life, I think I'm not going to make this. And the journey I've gone on in writing this play - I've softened a lot about all of that stuff because essentially it's just about realizing that there are things that are beyond your control that you can't control. MARTEN: (As Doctor) Instead of declaring ourselves powerless over alcohol and drugs, we admit that we are powerless over people, places and things - people who make us want to relapse, places we associate with using and things that reactivate old behavior. Does this make sense to you? LUNDEN: Part of the process the addicts go through at the recovery center where most of the play takes place is rehearsing what they'll say to people out in the, quote, unquote, "real world." It's something that the character Emma, who's an actress, is well-versed at. But once she ventures outside and confronts those people, places and things, she gets knocked for a loop all over again, says actress Denise Gough. GOUGH: You don't know at the end of the play if she's going to be all right. And that's really important because we can't know. I didn't want to be in a play that sugarcoated any of this. There's no point. I've met and know and have been around too many people who have suffered this disease to go on stage and say there's a happy ending. We don't know that. It's one day at a time. LUNDEN: And it's a life-and-death point Playwright Duncan MacMillan says he wanted to make. MACMILLAN: One day at a time. And life has to win every single day, and death only has to win once. LUNDEN: For NPR News, I'm Jeff Lunden in New York. Transcript provided by NPR, Copyright NPR.